A funny word, that once you have heard it will stay in your memory! These clouds look different. Almost space like. Some people believe they are the reason for some UFO reports. The are formed in the troposphere at between 6500 and 16500 feet and never result in rain or snow (or anything else that may fall out of a cloud!). The latin name Altocumulus lenticularis meaning “like a lens” describes their shape perfectly. They are only found in the mountains on the leeward side of the peaks. As moist air flows over the top of a mountain the peak disturbs the flow of the air forming an eddie, an area of turbulence. If the air is cooler within this turbulence than the local dew point then the air may condense to form lenticular clouds. These small clouds in Norway were just the beginning. 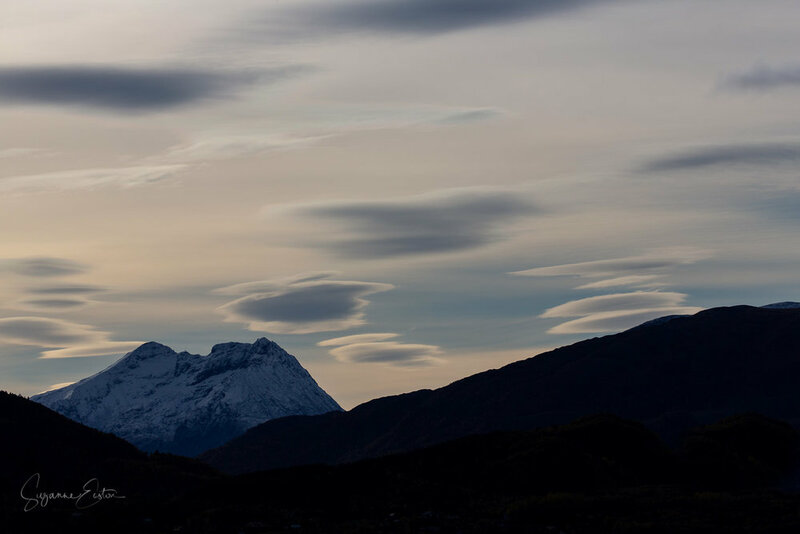 Lenticular clouds can be huge, stacking through the sky as they form at different heights through the atmosphere. Lenticular clouds become more magical and unique as iridescence can sometimes be seen, bright colours shimmering around the edges of the cloud.